Experience the Creative Process: Robert presents interactive multi-discipline arts experiences, drawing upon his years as a professional practitioner in the visual, theatrical and musical arts to deepen the child’s written expression. He tailors his residencies to reinforce academic achievement. He enjoys the adventures of collaborating with teachers, taking the “driest,” the most difficult subjects, and bringing them to life and infusing them with creativity and energy. Robert will create both a memorable and enriching creative experience for ALL the children he works with, even those who may be difficult to reach through traditional academic methods. Program Description: Robert Maniscalco, who is an award-winning professional artist and gallierist with over 38 years of experience, has placed hundreds of portraits and fine art into the collections of top corporations and institutions as well as their families. He is also an award-winning professional actor, performing and directing in over a hundred theatre productions and films over the years. He has published several books and instructional videos and produced several film and video productions, including his two seasons as host of “ArtBeat” on PBS in Detroit. 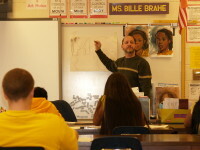 He is a dedicated teacher of painting, acting and music (BM from WSU) and has been presenting innovative programs in schools throughout his career, enthusiastically sharing his passion for the arts. He is committed to “visual literacy” and the idea that everybody can and should learn to draw, even if they don’t exhibit “talent” or aspire to be a professional artist. He believes learning to draw, which is the art of making connections, is essential for higher learning and is available to everyone. 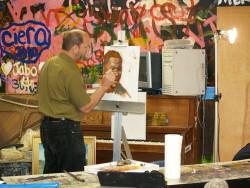 Robert is well known among his peers for his “Power of Positive Painting” presentations and his enthusiasm for turning common ideas into works of art. 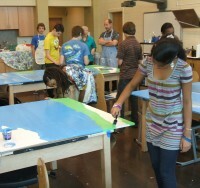 “Being the Artist-in-residence of North Charleston was an exhilarating creative experience for me. My over riding mission has been to plant the seeds of visual literacy and a love and appreciation for observational drawing in the fertile minds of the young people in some of the most “at risk” communities in North Charleston. 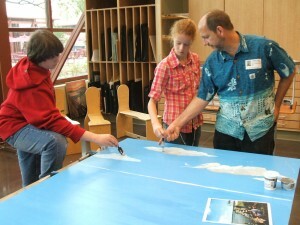 These are some photos that were taken at Alice Burney Middle School seventh grade art class, part of a 2 week residency there. I watch the faces of these kids open as they discover an entirely new part of their brain and begin to draw with sophistication and specificity, truly seeing possibly for the first time in their lives. I see them as taking control of their world in some small yet profound way. I’ve encouraged them to imagine a life filled with possibility, to follow their passions and not just accept their lot in life as if it were somehow real. There is great joy in giving ourselves over to something we thought was simply beyond our grasp. There is a deep satisfaction that comes from learning a skill that can be practiced and honed our whole lives, if there is a desire. That desire comes from understanding. I realize it is a rare gift: to give and to be given a structure where success is possible. To make art is to see in a way that goes beyond survival. Why not take on a cause, become a force to be reckoned with? Art has the power to transform lives. To see the face of someone truly lost in the reverie of a line. I see drawing as a celebration of how things are connected. This is a form of spiritual devotion few will ever take the time to develop. That’s what we do. 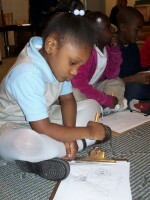 Using gesture and envelope we created some pretty convincing self portraits. 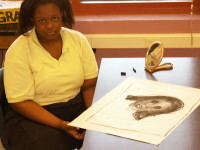 We create art related to the subjects the kids are learning. Today while I was painting I started talking about developing internal rewards rather than trying to impress others. If I could have learned that lesson when I was young I can only imagine the heartache I could have avoided. Then I started begging the kids not to put off pursuing their dreams until they are too old to do anything about them. These kids deal with a lot of pressure to achieve and not enough on loving their work. Young people are literally starving to hear someone just level with them. 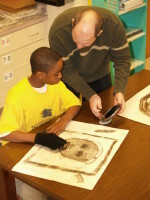 I’m always looking for a more direct, authentic experience with my work as an artist and a teacher. Even in my big groups as AIR of North Charleston I was always discovering those little one-on-one moments between the master and the apprentice. Those little “aha” moments when someone sees an abstract shape for the first time in their lives. I love to open myself up to these young people, being vulnerable as an artist on a journey, not as a polished “success” to rub in their faces. I get them to think about their own life journey, with all the struggles and obstacles, as a part of their own creative adventure. It is possible to be a success and fallible. In fact it is impossible to succeed without being willing to make a complete fool of yourself along the way. 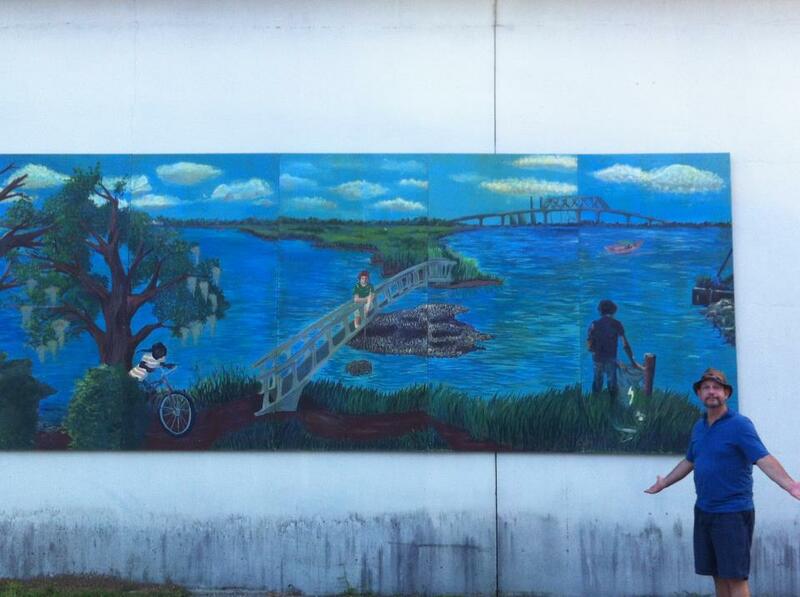 This is the finished mural I helped facilitate at the School of the Arts in North Charleston. Over 20 students worked on the project, from sketches and photographs taken as part of an ecological study of the waterfront area in North Charleston, to a finished work of art.